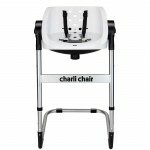 The CharliChair 2 in 1 has the added bath option for those mums who prefer their bubs submerged in water whilst still remaining in the upright position. It’s sleek light weight design allows you to manoeuvre the chair effortlessly. Have you struggled with the everyday kneeling and bending over a bath tub that is just not close enough or high enough? Well here’s your answer. The CharliChair 2 in 1 allows you the convenience of the three level height adjustment for yourself and the multi-position recline for your baby. With the CharliChair 2 in 1 your child will grow loving the shower as they will be accustomed to it from birth. The CharliChair 2 in 1 is the stress-free and pain-free answer to infant bathing woes. The CharliChair 2 in 1 is Australian designed, engineered and owned.